Senior forward Chandler Parsons may not have been in the starting lineup for the No. 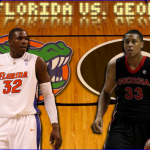 13 Florida Gators (22-5, 11-2 SEC) on Thursday, but he saw starter minutes and scored 16 points off the bench to lead his team to a 71-62 victory over the Georgia Bulldogs (18-9, 7-6 SEC) at the Stephen C. O’Connell Center in Gainesville, FL. With the win, Florida clinched the Southeastern Conference East division title for the first time since 2007 and earned a bye in the 2011 SEC Tournament next month. Gators sophomore guard Kenny Boynton scored a team-high 18 points, dished a team-best four assists and hit 5-of-6 attempts from the charity stripe to spark a big second-half comeback win for Florida. Junior point guard Erving Walker added 15 points, and senior F Alex Tyus scored 12 points on 5-of-10 shooting to support redshirt senior center Vernon Macklin, who struggled getting access to the basket. Walker scored the first eight points from the field for UF as the rest of his team started 0-for-11 from the floor. The Gators were up 10-8 with 14:59 left in the first half but quickly dropped their advantage and trailed the remainder of the half. The Bulldogs used a 13-2 run to go up 21-12 and eventually took a game-high 11-point lead at 31-20 with 3:24 remaining before the break. Florida reduced Georgia’s lead to seven before heading into the locker rooms on a layup from Tyus. UF opened the second half with a dunk from Parsons on their second possession and an offensive rebound and layup from him on their third. The Gators completed a 13-4 run through the half (9-2 in the second) to tie the game at 35 for the first time in 17 minutes. A three-point play by Macklin (his first and only basket of the game, scored with 13:13 left) tied it again at 42, but a three by Parsons completed an 8-0 run for Florida to put them ahead 47-42. Three minutes later, Boynton took over, scoring 12-straight points for the Gators including a trio of three-pointers as part of a 12-2 run that gave Florida a 10-point lead, 63-53, with 5:09 to go. An immediate 6-0 run by UGA cut UF’s lead to four, but the Gators hit six free throws down the stretch to ensure the 14th victory in their last 16 games. 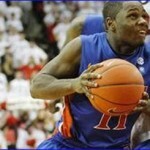 Despite struggling at times, G Travis Leslie led the Bulldogs with 20 points. Georgia F Trey Thompkins added 16 points and had a team-high seven rebounds. Though he had trouble getting going offensively, Macklin notched a team-high eight boards for the Gators and was 3-for-3 from the free throw line. Parsons contributed seven rebounds and three assists and was one of a trio of Florida players with three offensive boards (Tyus, Macklin). With four points each at halftime, Boynton and Parsons scored 14 and 12, respectively, in the second half. Freshman F Casey Prather, who started for Parsons, was held scoreless and only played seven minutes due to Parsons staying in for 30. Shooting a paltry 37 percent in the first half (10-for-27), the Gators shot 53.6 percent (15-for-28) the rest of the way. Florida also shot 35 percent (7-of-20) from downtown and 70 percent (14-for-20) from the line. The opposite was true of the Bulldogs, which shot 60 percent in the first half but only 42.3 percent after the break and 20 percent from three (3-of-15) for the game. In addition to clinching the SEC East, UF’s win Thursday was their ninth-straight at home against UGA. The Gators have now won 14 of their last 16 games and defeated six consecutive conference opponents for the first time since 2007. Florida is also 19-1 when holding an opponent under 70 points this season. UF will play their second of three games in a seven-day span when they travel to Kentucky on Saturday. 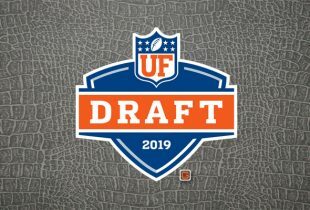 The game will air live on CBS at 4 p.m.
Notes: Former Florida football players wide receiver Louis Murphy, tight end Cornelius Ingram and cornerback Dorian Munroe took in the game. Also in attendance were head football coach Will Muschamp and former basketball C (and recent cancer survivor) Dwayne Schintzius. Another huge win! Chandler played a superb game! Scary start early, but great night to be a Gator! This team has finally gotten it, know how to win and be disciplined. Baseball looks almost unbeatable too! just waiting to see the ladies rock Texas in Softball, still hasn’t started yet. weather out here in CA is bad tnoight, not sure what it is like down in SoCal, but in the SF bay area, we may actually get snow at sea level for the first time in forever. Wow, seriously? Snow in SF bay? I am on the Oregon coast Ken and it is snowing here which is still unusual. Great win gators, cannot believe this after the start we had! I thought he played well tonight, and Chandler was awesome. They commented during game that his type of injury usually was 4-6 weeks recover, what a trooper! Parsons was very lucky – had he required blood thinners to treat the pooled blood, he would have been out 4 -6 weeks to treat and then wean off the anticoagulants. Great comeback for his Sr season!! SEC Player of the Year!?! Didn’t catch the first half, but Walker had a great second hAlf. That’s what we need from him. Missed the first half coming back from the shuttle launch, but it sounds like that was a good thing. This team is tough, we keep getting contributions from different people. When we hit our free throws our defense seals the wins. Nice win. I just wish we could put together two solid halves in one game. For ten minutes they seem as though they can’t do anything right – then they play ten minutes like world beaters. Atleast they have learned to fight back. But, they are going to have to learn how to put together a complete game for 40 minutes to go deep in the tourney. If that were one of the top teir teams fom the Big East, Duke or OSU we probably would never recover.